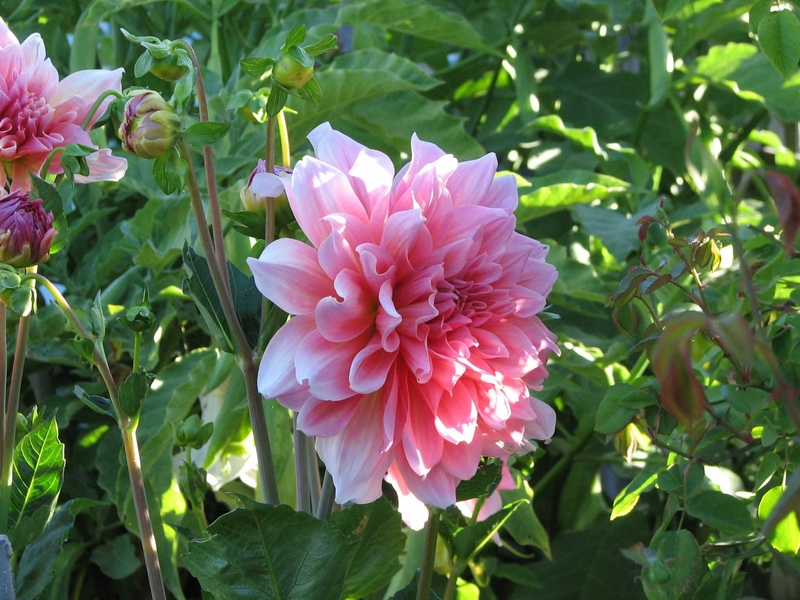 Deadheading - an easy way to prolong the bloom! 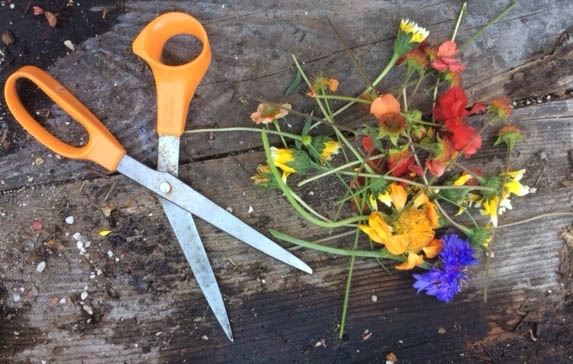 Deadheaded, spent flowers from the author's garden. Deadheading may be a theraputic form of stress relief! In order to deadhead, you need only simple tools: pruning shears or scissors (even sometimes your fingers) and a little bit of time. 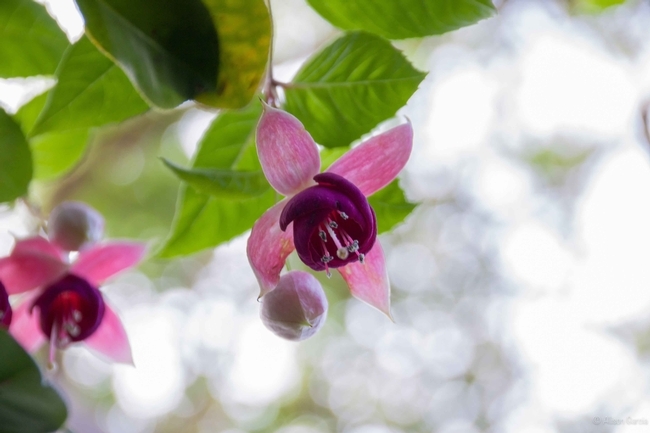 Once you've removed the flowers, you can drop them on the soil by your plants and they will contribute more organic matter to the soil as they decay or you can add them to your compost pile. 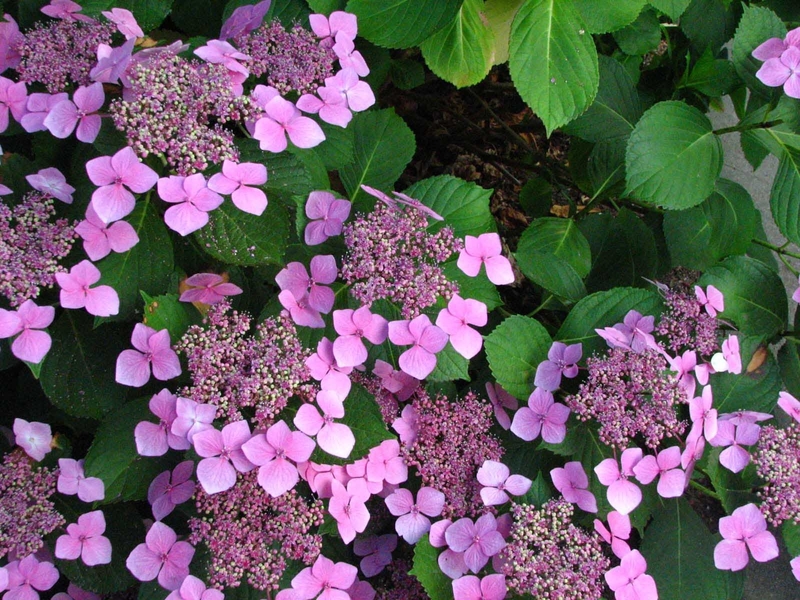 The reason deadheading works is that it tricks the plant into continuing to flower in an effort to complete its reproductive cycle. 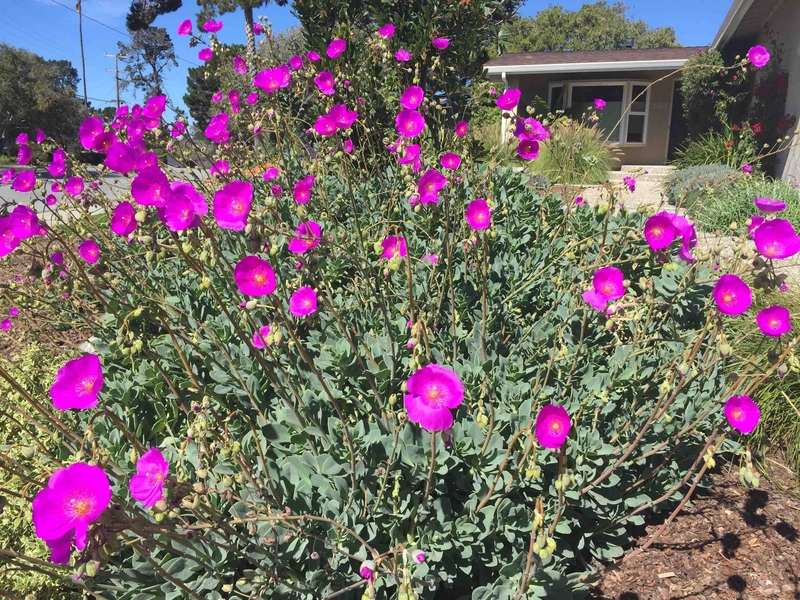 I've successfully kept native wildflowers such as Clarkia and Tidy Tips blooming for months by deadheading. 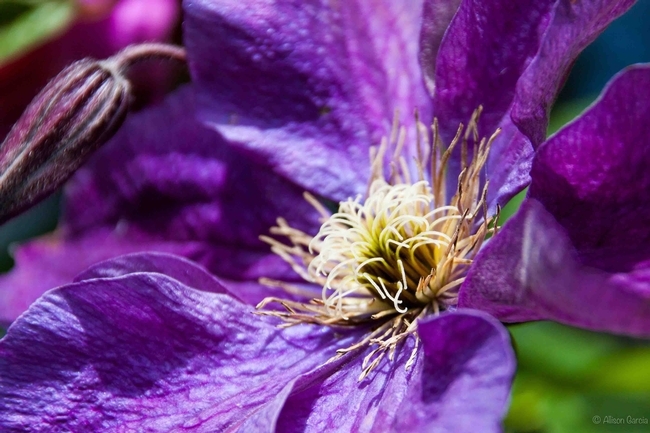 Other flowers which respond well to deadheading include bachelor's buttons, blanket flower, coneflowers, cosmos, dahlias, geums, roses, salvia, snapdragons, sunflowers and yarrow. Of course, deadheading is an optional task, but if you do it, you may be able to enjoy your flowers for just a little bit longer! The large, stunning landscape plant Dasylirion longissimum, or Mexican Grass Tree, is native to the hot, dry Chihuahuan desert and other xeric habitats in northeastern Mexico. The fine, graceful 4' glaucous leaves radiate out densely from a large, woody trunk and form a large half sphere. 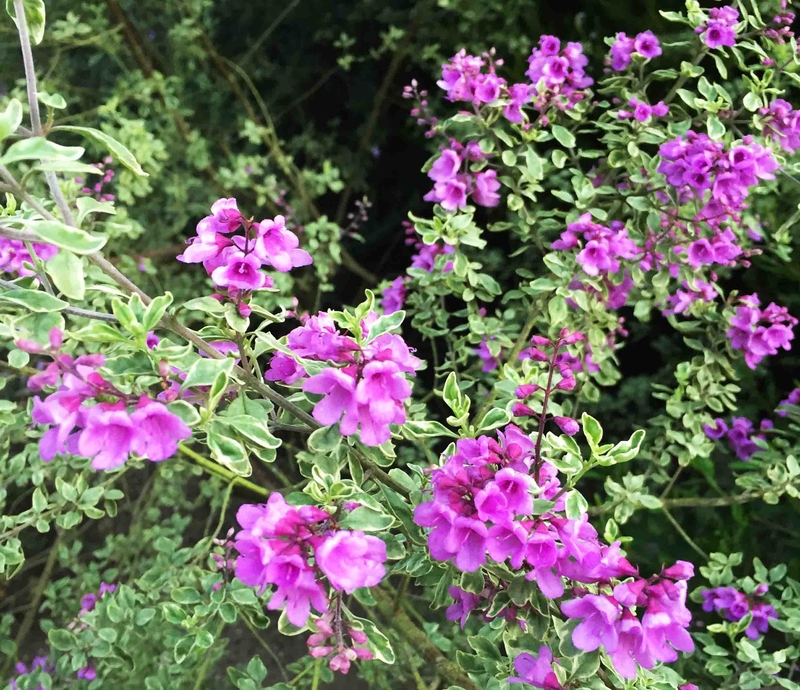 The stiff, narrow, smooth and satiny 1/4” to 3/8” leaves sway and shimmer beautifully with the slightest breeze, providing interest year-round. 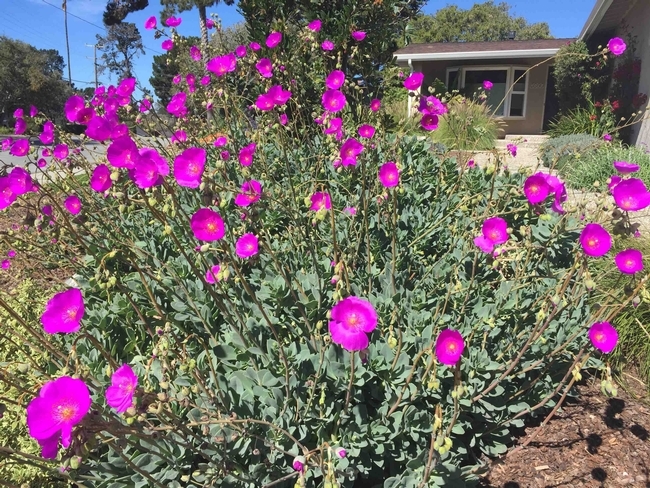 Given plenty of space, as it grows to 8' in diameter and 15' or taller at maturity, this evergreen, flowering plant makes a unique focal point in a xeric or drought tolerant landscape. 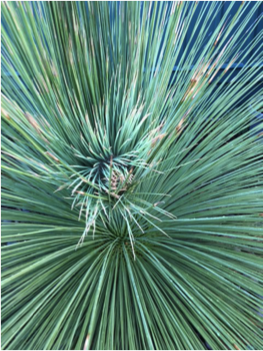 The requirements for this grass tree to be successful are full sun, well-drained soil and no or minimal summer water. It is cold hardy to at least 15 degrees, can withstand severe drought and grows in Sunset zones 11-24. The only disease it may encounter is root rot if the soil is too wet. It is pest free, deer resistant and fire retardant. Weeding around the base is the only challenge you will have with this carefree plant. The flower spike of Dasylirion longissimum, or Mexican Grass Tree. By my best estimates, this particular specimen in the photos is about 17-18 years old. 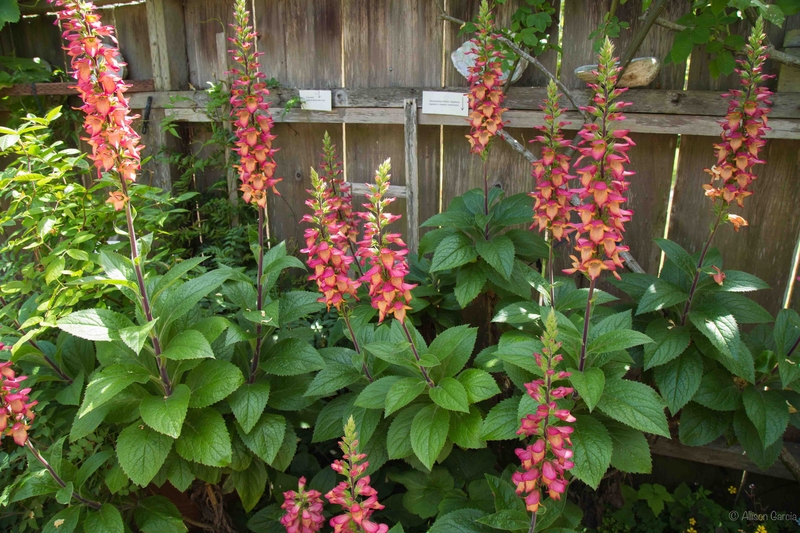 I transplanted it from my previous yard in January 2007 where it had been in the ground for about five years. It was in a two-gallon pot when originally purchased. 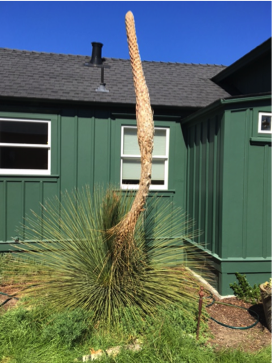 This last October it started putting out its first-ever flower spike and now six months later, is easily 12' tall from the ground. 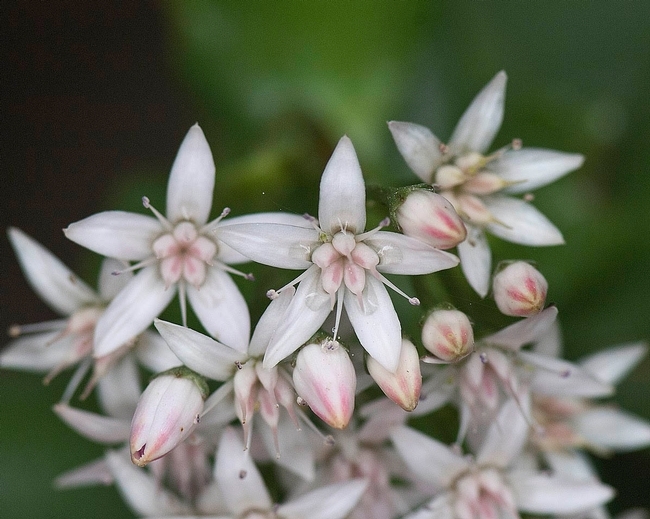 There are numerous pollen-laden small white flowers on each node that emerge from the stalk about half way up it-far too many to begin to count. The bees are constantly visiting it and I can hear the din of them from fifteen feet away. There are 20-22 species in the genus Dasylirion that belong to the Dracaena family. As the plant slowly grows, a thick dark trunk becomes visible. Older leaves droop around the base and can be trimmed off as with palm leaves, or left to form a shaggy buttress that collects water and provides support and habitat. I will not outlive my beloved grass tree as they can survive to 150 years or more, but I enjoy it daily and am amazed at its awesome blossom! 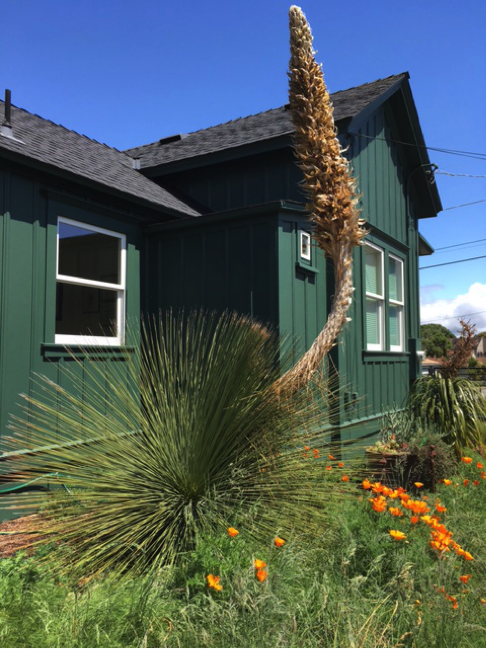 Mexican Grass Tree's awesome blossom! Mushroom compost. 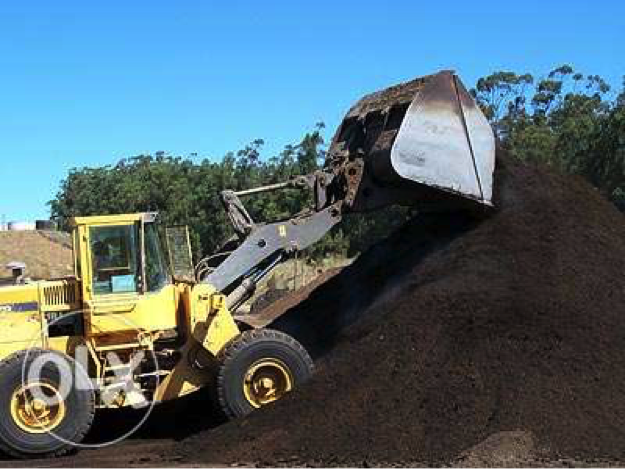 Image from: https://www.olx.co.za/ad/mushroom-compost-lawn-dressing-potting-soil-order-we-deliver-whole-cap-ID15MxLA.html. Tip! 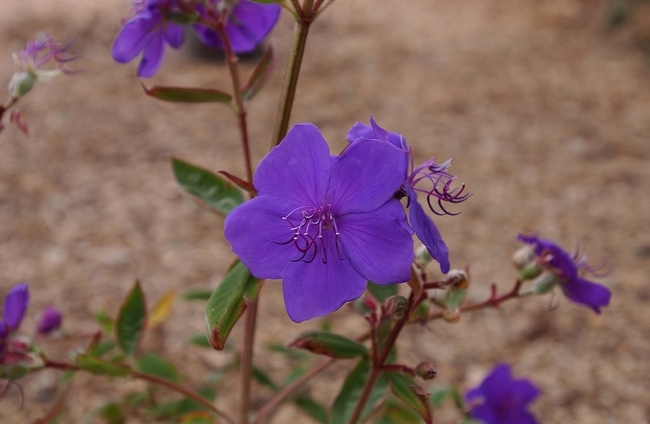 This plant calculator gives you how many plants per square foot for cost estimation purposes! You work long hours and want to get this 10' x 10' garden bed set up and planted ASAP. You have available cash so you call the nearest home supply store and have them deliver 2 yards of compost. You hire the high school kid next door to move it and dig it in. 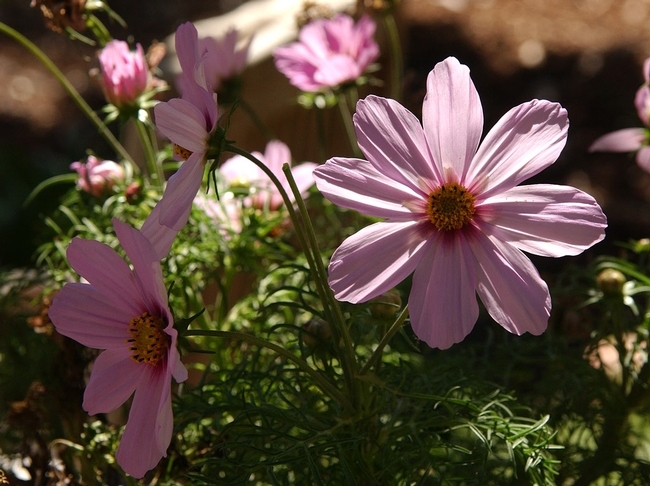 You fertilize and plant purchased seedlings. By Sunday evening you have a garden installed and go bed dreaming of fresh produce. * These estimates don't include the cost of fertilizer or tools or building a raised bed if that's desired. Clearly this person is gardening for love, not profit! You have more time than money to spend on the yard. You know the community is full of free organic material and you are the one to recycle it. You plan ahead, collect materials, plant from seed, maintain your own compost pile and have access to a truck or vehicle that can haul messy manure, food scraps, etc. Coffee grounds. Image from: http://www.thesleuthjournal.com/5-ways-use-spent-coffee-grounds/ . Horse stables - sometimes they will load it for free or a small fee. Take it from the darkest composted pile. 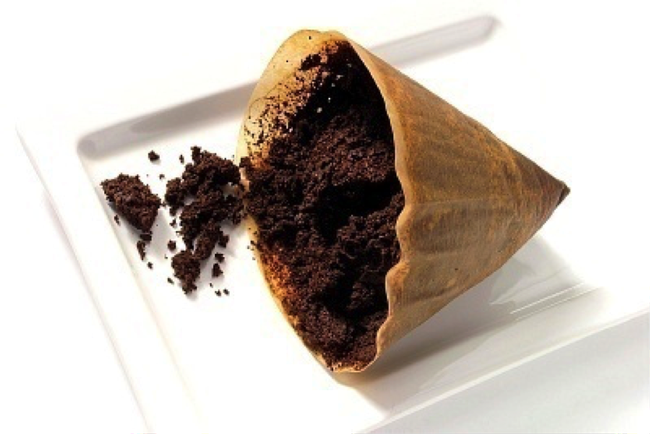 Coffee grounds - bring a bucket to Peet's in the morning, pick it up in the afternoon. Make manure. Get some chickens or rabbits. Compostable produce scraps at grocery stores - bring a bin or a bag and pick up. Labor Your labor. You know how you value your time. $? * These estimates don't include the cost of fertilizer or tools or building a raised bed if that's desired. This is a high profit veggie plot, pays off in organic produce! Buckwheat cover crop. Image source: http://www.caes.uga.edu/newswire/story.html?storyid=5891 . You know that good soil builds over time and you're in no hurry to get things planted before the soil is good and ready to receive. One fast, effective way to get poor soil dramatically improved is to grow a cover crop and dig it in to decompose. Growing a legume cover crop will also fertilize by fixing nitrogen from the air to the soil. 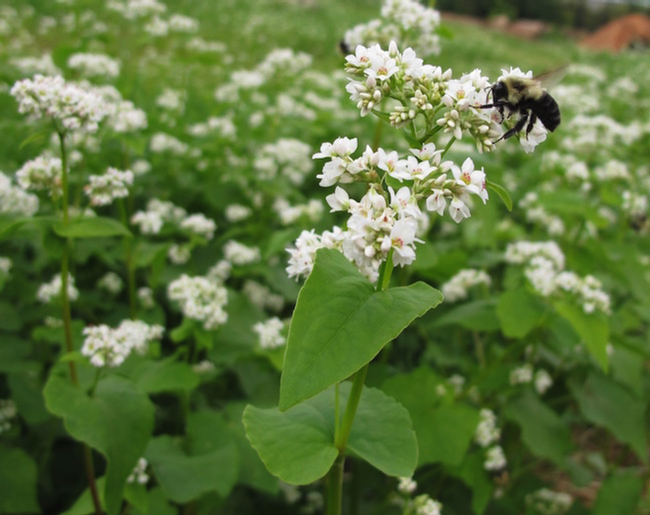 Cover crops break up compacted soil, suppress weeds, create habitat for beneficial insects and provide biomass that becomes humus. You enjoy the cover crop foliage and bloom for 2-3 months, dig it in, and wait for 3 weeks before planting a late summer or fall garden. Cover crops recommended for summer planting in the Monterey Bay Area include buckwheat, mustard, red clover, and crimson clover. Try local feed and garden supply stores or look online to purchase. FAST growing, quick flower, soft stems are easy to dig into the soil. Good for filling empty spaces in summer. Blooms provide habitat for beneficial insects – beautiful! Crimson clover has a gorgeous magenta flower and fixes nitrogen. Labor All of these are much easier to dig into the soil than winter cover crops. Dig your own or enlist some help. $? Read more about cover crops here, here and here. The Lasagna Gardener - Improve Your Soil and Eat It Too! You want those summer peppers and tomatoes soon but you DO NOT want to dig and you definitely want the soil improved. Methods that let you have it all involve planting in composting materials. 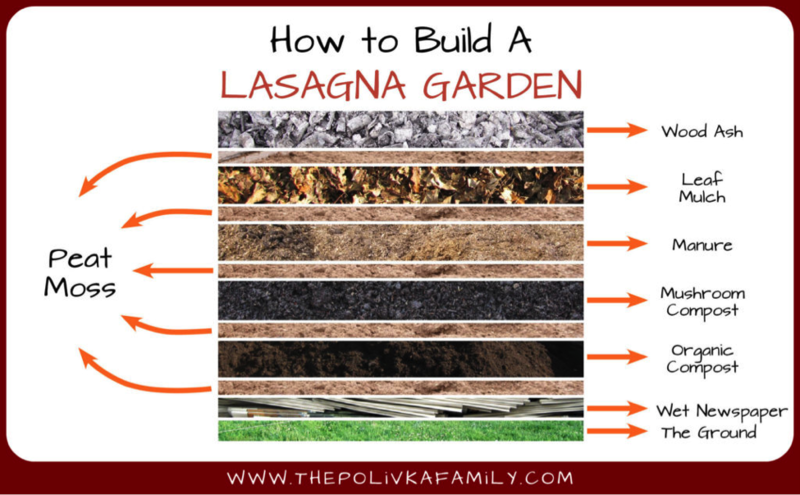 Two great ways to do this are lasagna gardening (AKA sheet composting) and straw bale gardening. Labor You'll need to assemble and/or transport all the materials and layer them, watering in between $? Cost and effort all depend on the size of your bed so here's a coverage calculator. Lasanga layers illustrated. Image from: https://www.revivedkitchen.com/2013/02/preparing-vegetable-beds-for-spring-lasagna-gardening/ . This is another approach where the growing medium degrades to become rich soil while hosting a crop at the same time. 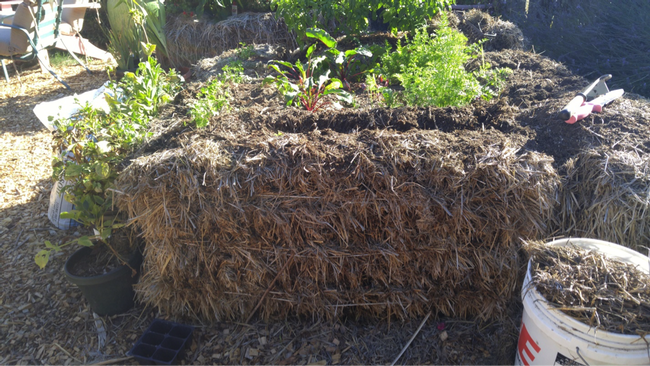 Read step by step instructions about straw bale gardens here or stay tuned for a straw bale class at the Demo Garden in July. Straw bale garden "bed." Four bales in a square filled with planting mix. Image by Delise Weir. Whether you are busy, frugal, patient or a lasagna gardener, or maybe even a combination of two or more types, there's a veggie gardening strategy out there to suit you. Remember, it's all about the soil and getting and keeping it ready to grow vegetables for you. 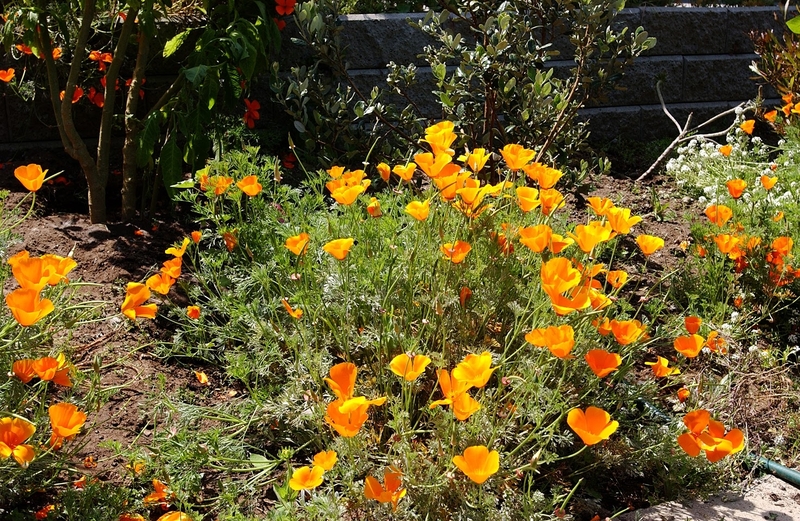 If you still have questions about how best to prepare your garden soil, take advantage of our FREE class in the Watsonville Demo Garden on Sunday, May 7th at 10am. For more information and to register, visit our website. We hope to see you at our class! Paul McCollum published this blog post several years ago and it holds up well today. 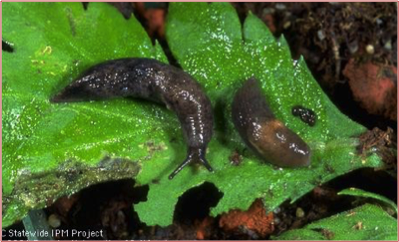 If slugs and snails are decimating your plants, collect them in the evening, when you're most likely to spot them. They make good snacks for hungry chickens! Sow seeds of nasturtiums, marigolds, portulaca, amaranth, salvias, vinca (Catharanthus roseus), sunflowers, and zinnias. 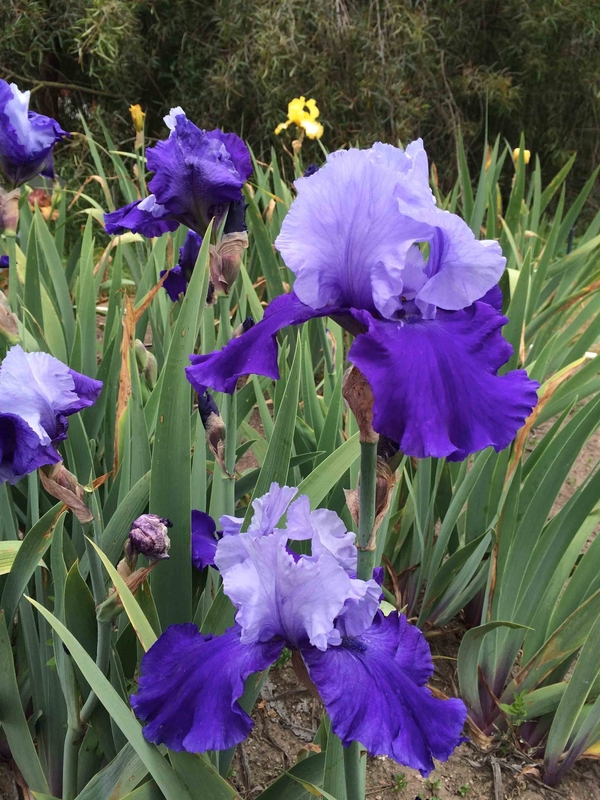 Spring has sprung and the bloom period is beginning! 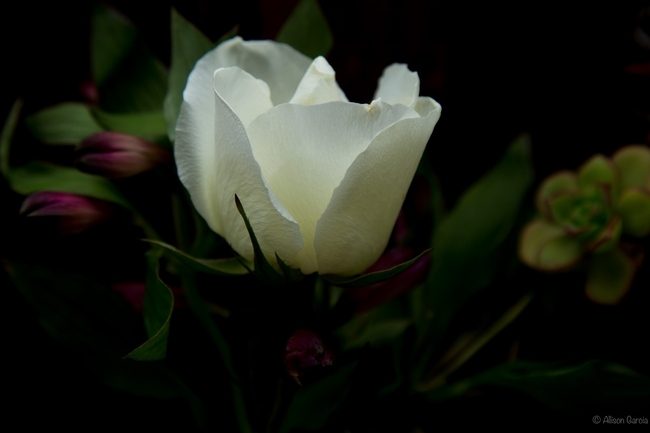 To celebrate I've put together a series of lovely flower images brought to you by talented Master Gardener-Photographers. Any errors in labeling are my own. Many of these photos were taken in gardens featured in our annual UCMGMB tours. Visit our website to find out about this year's tour - we hope to see you there. In the meantime, enjoy these beautiful pictures! Fuchsia. Photograph © Allison Garcia. 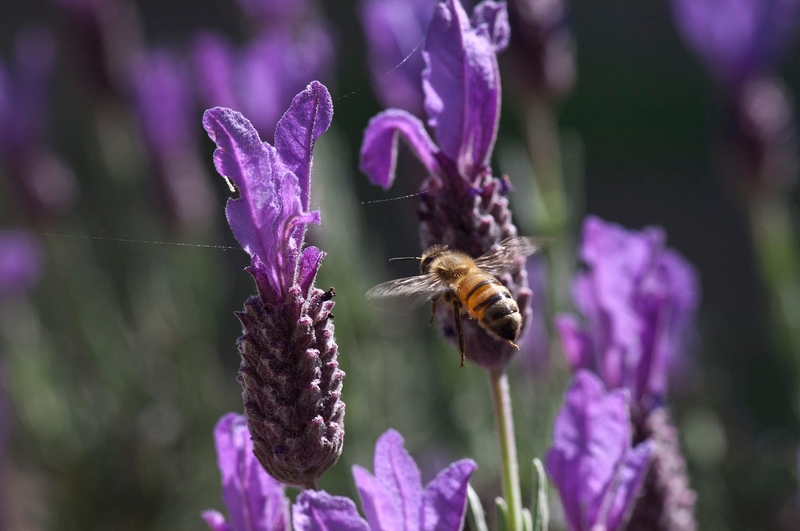 Honeybee on lavender. Photograph © Leora Worthington. 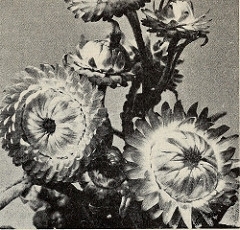 Calandrinia. Photograph © Jazmin Lopez. California poppies. Photograph © Leora Worthington. 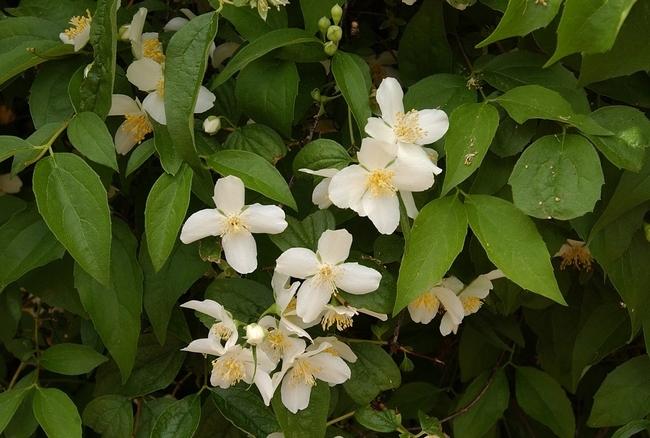 Bush anemone. Photograph © Leora Worthington. Clematis. Photograph © Allison Garcia. Dahlia. Photograph © Anastatia Foster. Cosmos. Photograph © Leora Worthington. Digiplexis. Photograph © Allison Garcia. 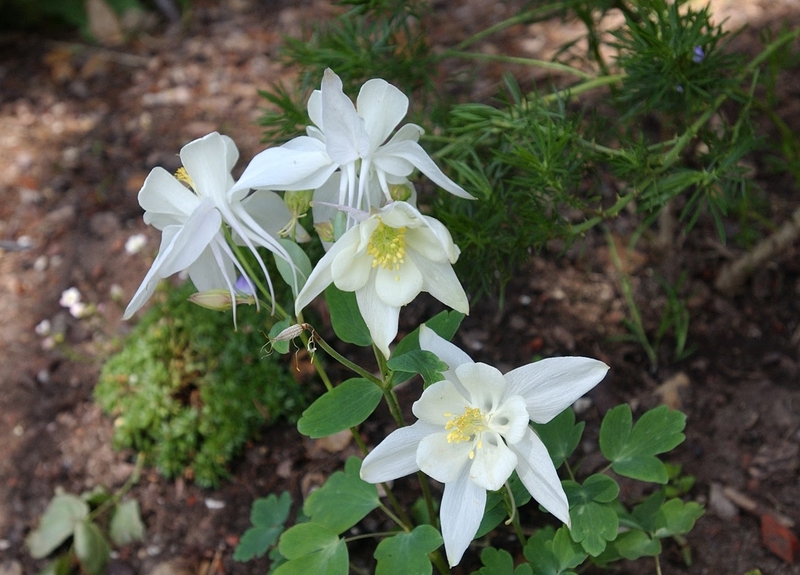 Columbine. Photograph © Leora Worthington. 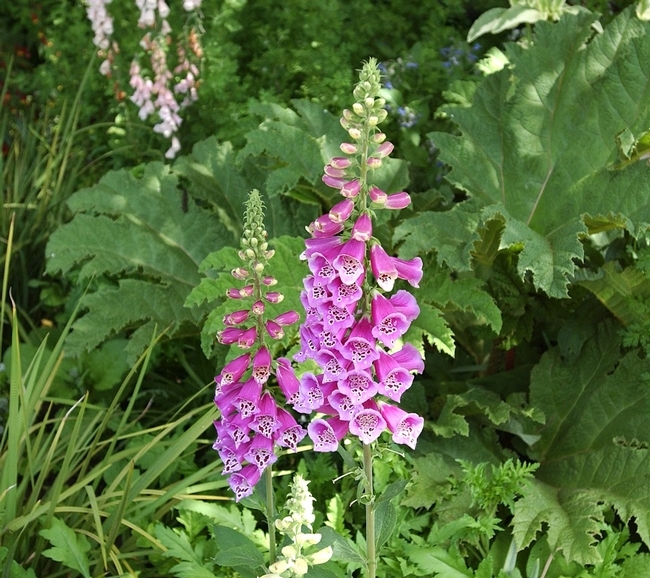 Foxglove. Photograph © Leora Worthington. 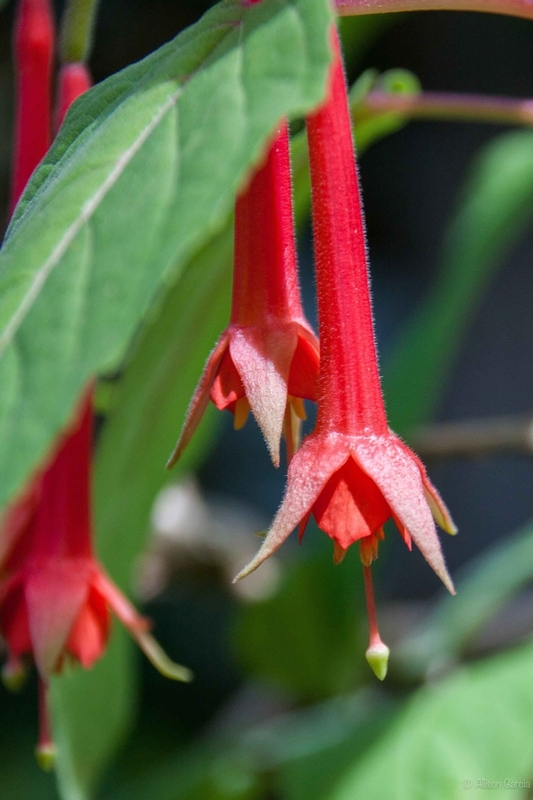 Fuchsia? Photograph © Allison Garcia. Hydrangea. Photograph © Anastatia Foster. Iris. Photograph © Delise Weir. Jade. Photograph © Leora Worthington. Lasiandra. Photograph © Leora Worthington. 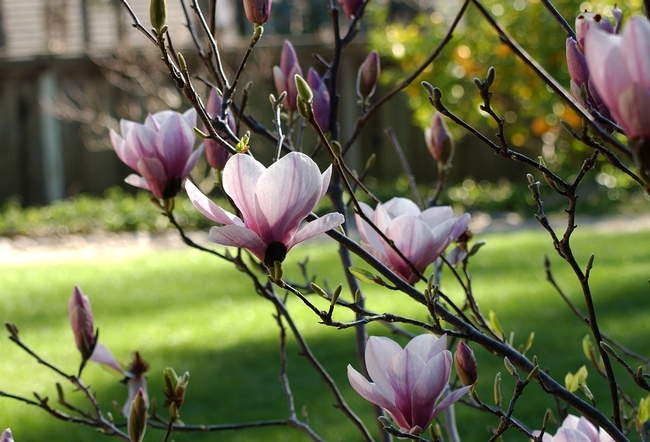 Magnolia. Photograph © Leora Worthington. 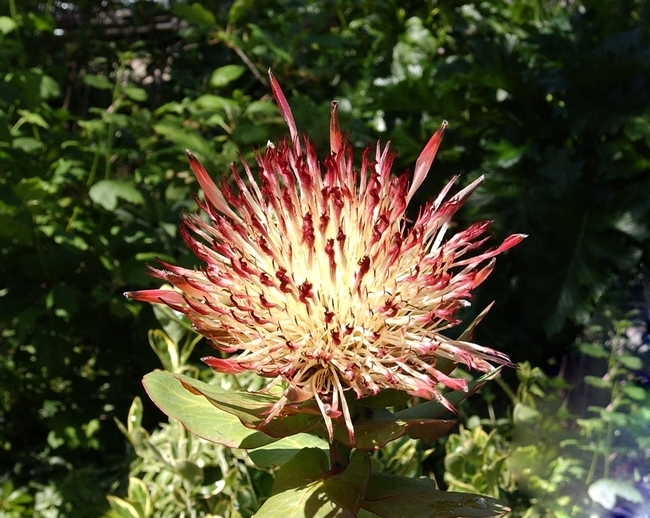 Protea. Photograph © Leora Worthington. Prostanthera ovalifolia 'Variegata.' Photograph © Patty Nicely. Rose. Photograph © Allison Garcia.